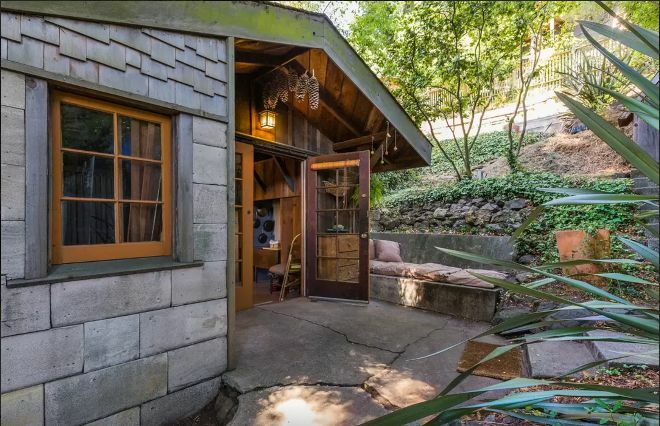 With only 750 square feet, you might expect this little carriage house, tucked away in the hills of Berkeley, Calif., to feel cramped. But step inside, and you'll discover a home fully equipped with every amenity, a bedroom with a walk-in closet, and a sizable deck area for relaxing. 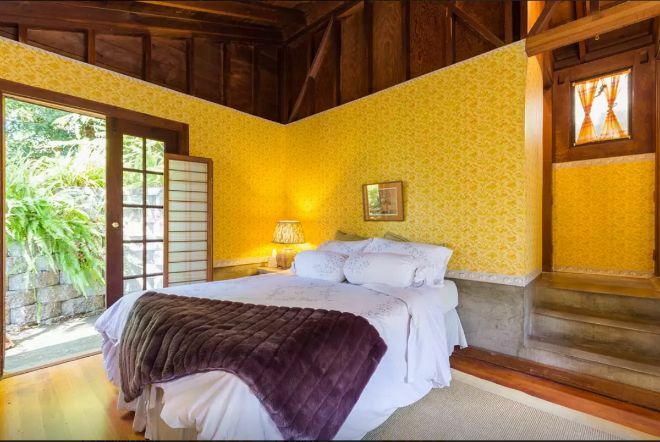 The carriage house, nicknamed The Cubby, once belonged to renowned architect Bernard Maybeck. Also a professor at the University of California, Berkeley, Maybeck designed many of the most well-known buildings in the Bay Area, including San Francisco's Palace of Fine Arts and Berkeley's First Church of Christ, Scientist, which is considered to be his masterpiece. Maybeck was actively involved in planning many of the nearby hillside communities, and believed that architecture should enhance its surroundings. The main house of the Maybeck estate has burned down, but the carriage house remains. 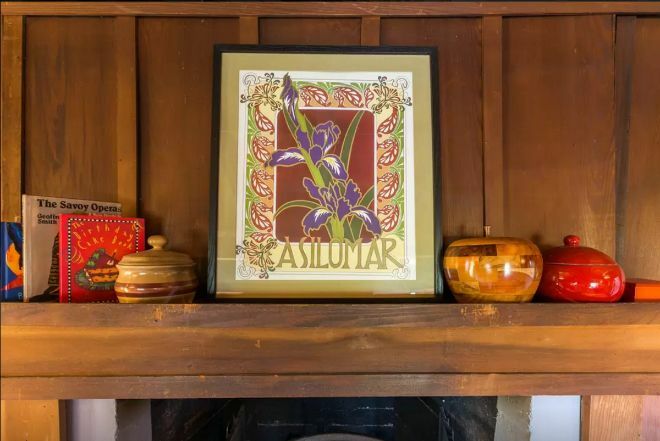 The current owner lists it on Airbnb for short-term renting, describing it as "private" and "rustic." 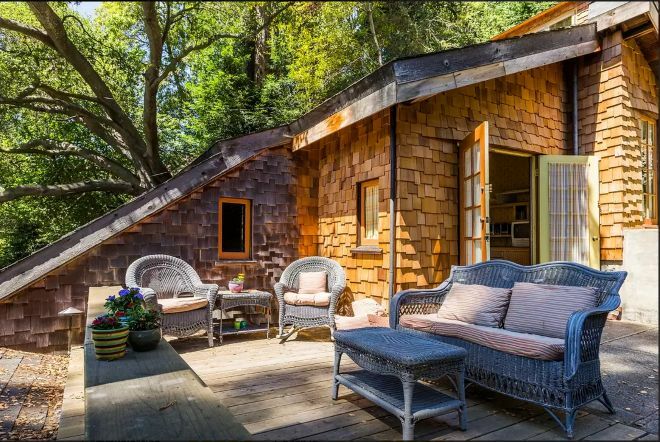 The peaceful cabin certainly lives up to that description. 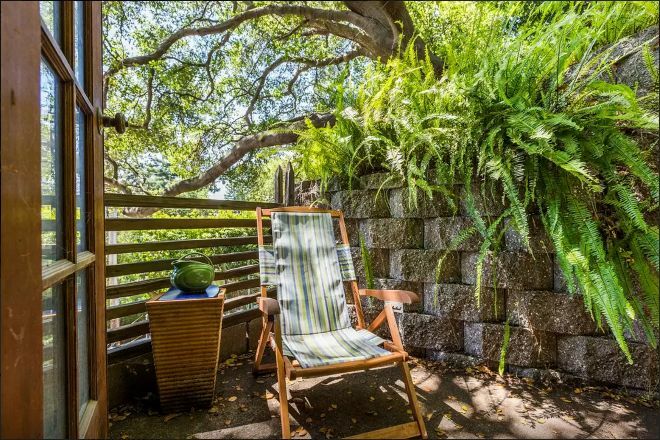 Even before you've entered, the entryway hides behind a canopy of foliage. Its welcoming doors are both transparent, but remain secluded. Everything about this place speaks to those who might want a retreat from the hustle and bustle of the city. Take a step inside, and you're greeted by a collection of everything you might need for an extended stay. Everything from a washer and dryer to an oven, range, and sink, there's nothing you could want that isn't already here. 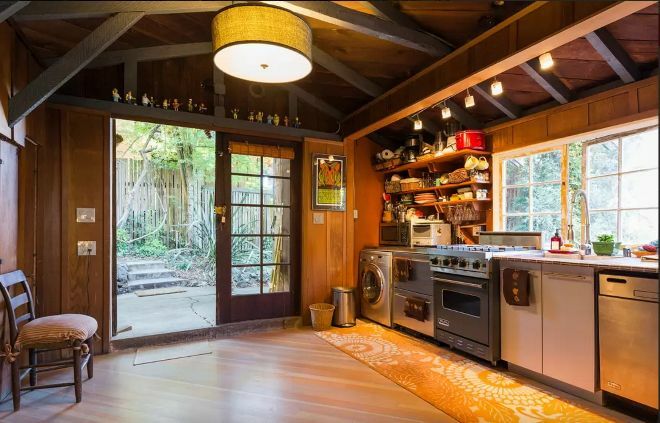 Light spews in through both the front door and the large windows that sit in front of the kitchen sink. They peek out into the wooded surroundings so that you can cook and even clean up after a meal with a view. 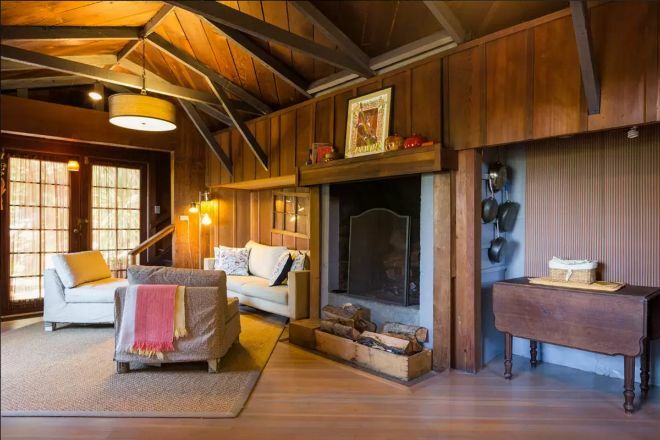 There's ample room for a sitting area next to a generous fireplace. And, even though the spaces are combined, they are separated through the placement and orientation of the furniture to create the feeling of separate environments. Just look at the view from the cooking area. Small touches add depth and character to the abode. A small dining table pulls out from the wall, ready for guests or a pleasant evening at home. There's a queen-size bed in the upstairs bedroom. 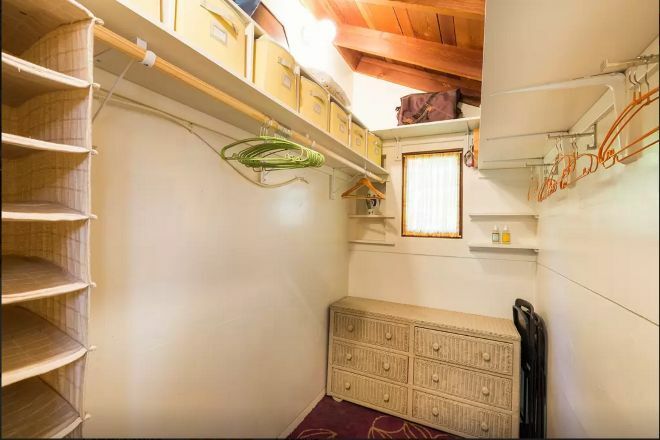 The tiny cabin even includes a walk-in closet. 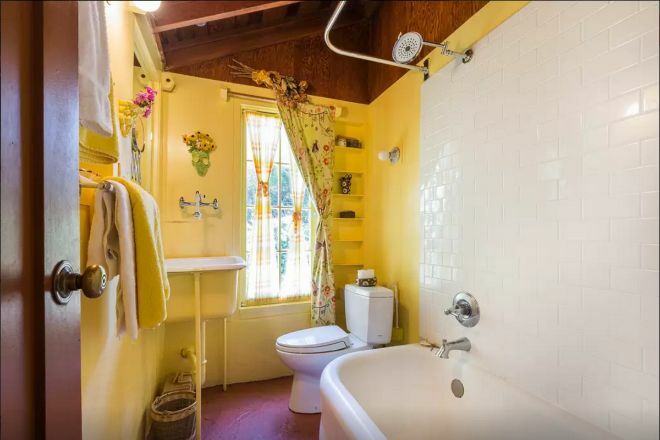 It also has master bathroom and a second bathroom for guests too. The guest bedroom is a splendid place to be. 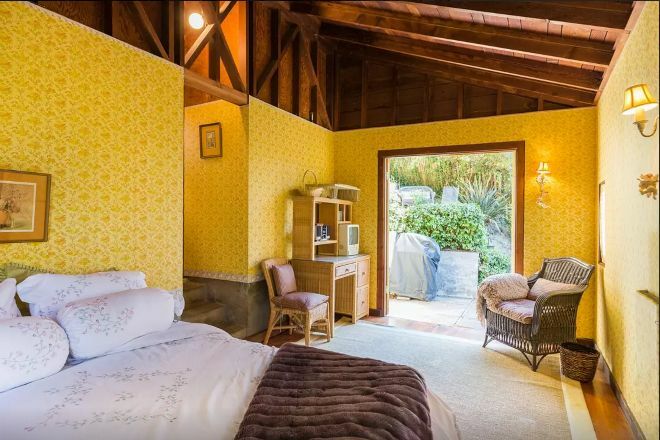 And there is a "secret porch" off the guest bedroom. 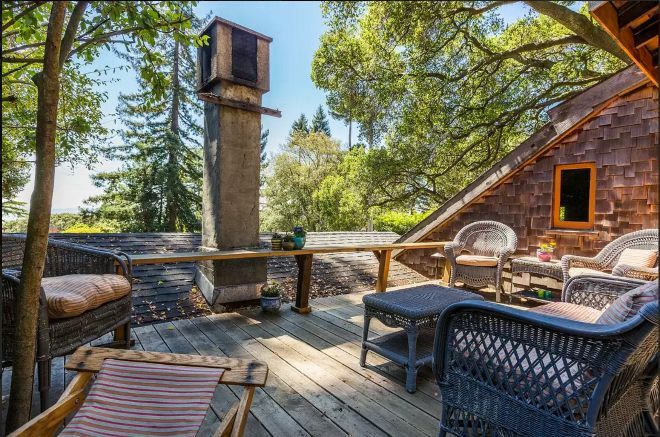 There is also a deck with plenty of room for guests. And there is an outdoor seating area for two where we could imagine spending endless hours with a loved one. 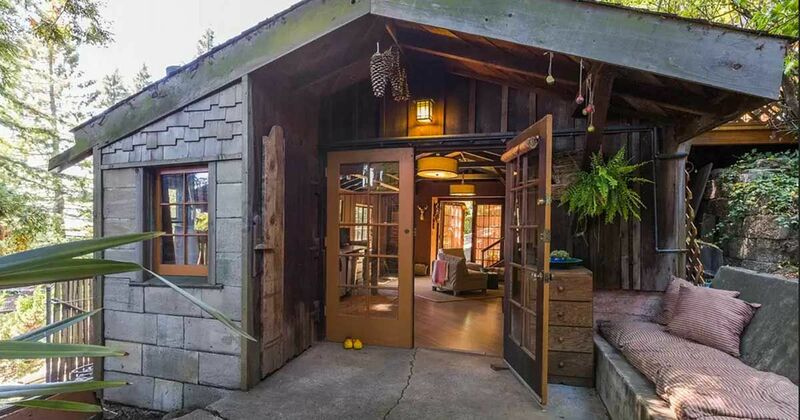 Step inside and take the tour of this charming wooden retreat. 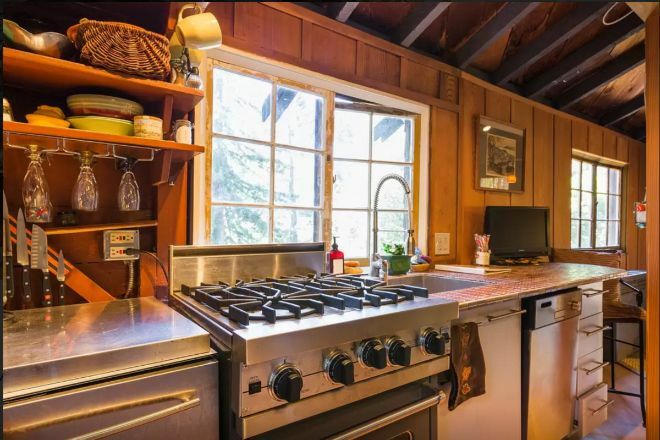 This beautiful cabin in the wilderness offers both a quiet retreat and access to thrilling hiking trails. 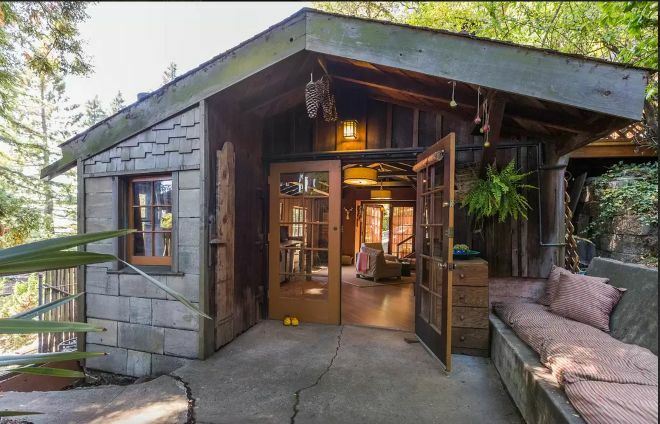 This gorgeous rustic home boasts a wraparound porch and beautifully original staircase, among other assets. 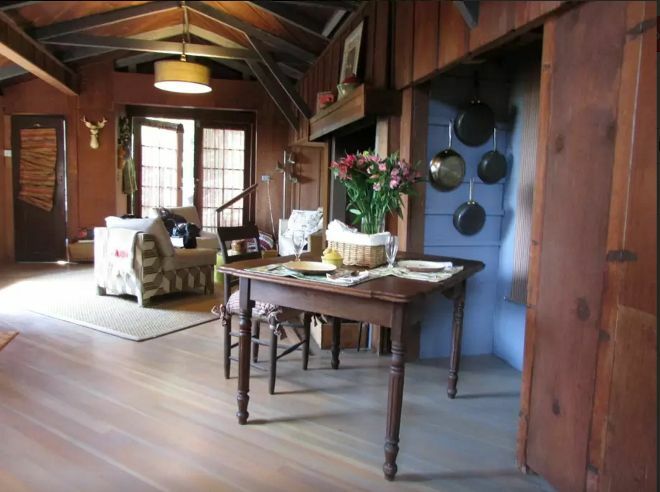 Located in the Blue Ridge Mountains, with the fashionable style of a present-day build. 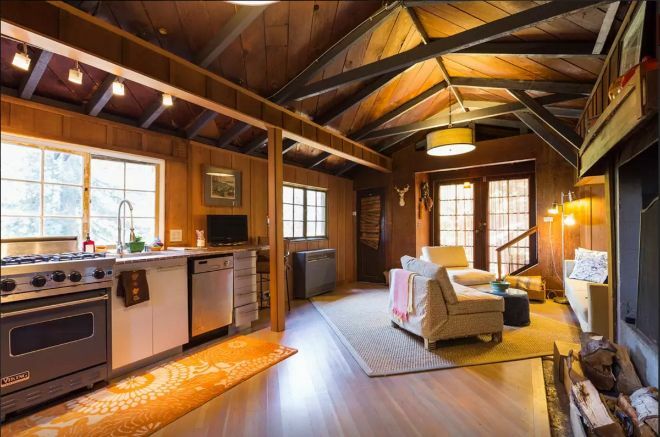 A rustic A-frame cabin with an intelligent 755-square-foot interior.